How do we learn to stand still in such a stormy world? In Norse shamanism, the Runes are little stones, usually made of clay, with a symbol on them which carry a specific energy. Runes when properly activated and when a relationship is developed between the medicine man and them can open doors to other dimensions and spirits. I have had the honor to study them the last 4 years with my talented teacher Jeremy White. The rune which represents the “medicine man/shaman” is one of the simplest one “Isa” which is a simple vertical bar (see photo). This rune despite its simplicity carries many layers of information and energies. But its main meaning, what it invites us to be, is to stand still. Feet deeply anchored in the ground. Spine straight. Head connected to the spirits above and below. A reminder that the most important secret of awakening our power is not to do but to be. To stand still. A reminder that what we have to learn is to be able to withstand any storm and stay centered, still, anchored in the ground, and connected to Spirit. The more I walk my path, the more I am learning through the storms of my life and my heart, to reveal the essence of my center, and the more that center reveal itself to help me stand still! If I am able to stay calm, centered, even when everything “out there” trigger my wounds, my shame, my fears, I can learn to become this channel of peace the world needs desperately! The non-reacting is very common to many spiritual paths. From Judaism, to Christianity, from Buddhism to Zen, from Sufism to Shamanism. Too often we react. We feel the urge to control our emotions or others! To attack or fight ourselves and the world. Or even to run away or shut down. Yet “standing still” does not mean shutting down. 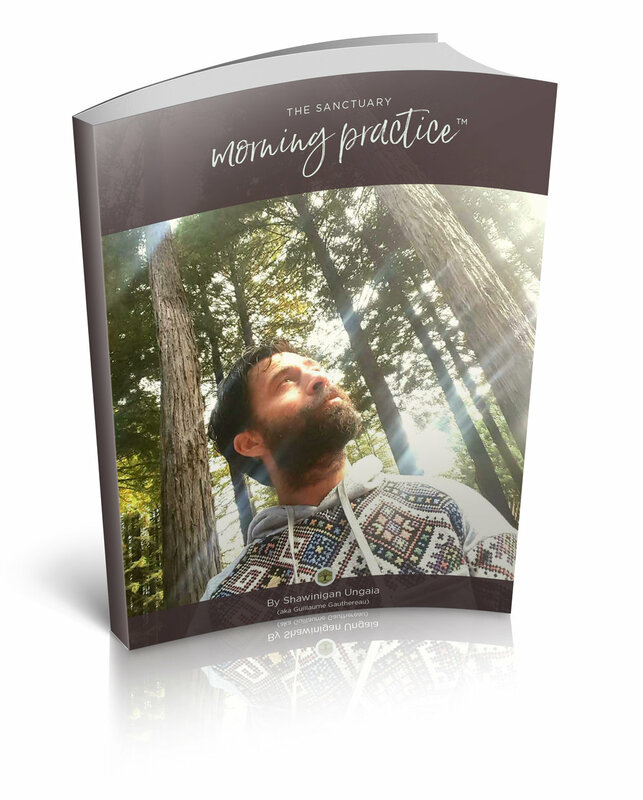 The practice is to continue opening our heart, feel more, let your wildness be alive, and allow more of the pain of the world and of others (including ours) to be felt. And yet stand still. It can take years, or a lifetime to truly master this skill. Spiritual by-passing is so common these days. Painting with layers of “all is love, all is light” every situation to prevent the feeling and the triggers. Yet the path is far from by-passing. It is to feel deeper, to feel the pain and anger, the shame and fears, of our wounded inner child. And in that space, to be able to witness, with love, compassion, and stillness, the movement and the storms of our mind and heart. If we can learn to hold that space with strength and yet gentleness, with focus and yet openness, we will be able to not only show up for ourselves in more loving ways, but also to hold that space for others in more compassionate ways. We are here to feel. To feel it all. Feel the depth of your hopelessness as Chogyam Trungpa puts it so well. Feel the depth of your losses, pains, and fears but with a caring compassionate presence. Feel the impermanence of our world with a great smile in your heart. But, to be able to stand still, you have to go to the depth of your body, to release its wounds. You have to breathe in every cell of your being to reveal what is hidden there. You cannot avoid facing your storms because if you do not, they will take over all your being-ness, all your stillness. From breathwork to shamanic healing, from sound healing to Reiki, from meditation to plant medicine journeys, there are many ways to go explore those depths while learning to hold your center. So stand still. But feel it ALL! Allow Love to flow even deeper inward and further outward from that still center. Let the wave of the oceans rage on the surface, while witnessing it from your calm and centered depth. If you can master that skill you will always stay connected to the flow of life, you will always feel more connected and loving with yourself and others. You will fall deeply in Love with yourself and others. And if you need help, reach out for a deep healing session to release what prevents you to connect to your stillness. Let your medicine come out!